My Remark: I followed the recipe and it worked out well except I use cake flour instead of superfine flour. I felt that it's abit rough in texture, not the same as wat you get the in restaurant, however other than that this recipe is a sure workable method. 1) Melt cream cheese, butter and milk over a double-boiler. Cool the mixture. 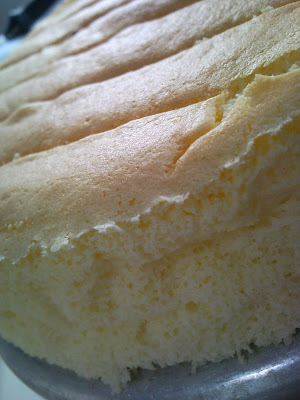 2) Sift the cream cheese to avoid lumps and to achieve smooth texture. 3) Add in lemon juice and egg yolks using wire whisk, mix well. 4) Add in flour and corn flour into the cream cheese mixture, a little at a time, until well mixed. 5) In a separate bowl, beat the egg white till foamy, then slowly add in cream of tartar. 6) When egg white mixture reaches soft peak, add in sugar slowly and continue to beat until you reach stiff peak. 7) Take 1/4 egg white mixture and add into cream cheese mixture, mix well. 8) Fold the remaining egg white mixture into the cream cheese mixture, do not overmix. 9) Pour mixture in 2x8' cake tin and lined the bottom and side with baking paper. 10) Bake at 160 deg C for 1 hour 20 min in water bath.